Greenhouse Growing System™ is committed to providing the highest quality industrial hemp plants. Our feminized hemp clones are organically grown in greenhouses and bred for low THC, High CBD / Cannabidiol production. Place your deposit to reserve plants in your delivery week now. Initial clone purchases are limited to 70,000 units per customer. These orders will be taken in a first come first serve basis. Currently we expect to offer 700,000+ clones which can be cut at a rate of 70,000 per week during peak weeks, (cut weeks 15-22). Those cuttings will be rooted and ready for pick up four weeks after the end of the initial week long harvest (6 weeks for 4” pots). Free potency testing services are included with every purchase of greater than or equal to 500 rooted units. Number of tests is limited to 1% of units purchased, with a maximum of 20 tests. Tests must be used within 6 months from date of purchase and only on the flower material produced from plants purchased. Customer is responsible for delivering samples to our lab. The Sweetened phenotype selected by GGS is unique in a few ways. It is a cross between a Cherry (Indica) and Otto II (Sativa), resulting in a blending of characteristics from both genetics. The expression of this phenotype is unique in that it is a vigorous growing plant with short internodes, resulting in a fast growing stocky plant. Another unique component is the terpene profile, the flower at maturity is sweetly aromatic. This phenotype has also shown increased resistance to powdery mildew and frost hardiness. Sweetened is our most popular variety with farmers, it can be grown in multiple growing conditions, from high alpine environments to hot deserts and everything in between. The Stout phenotype is a Sativa dominant plant selected by GGS that has a shorter internode length resulting in a stockier plant that does not stretch as much when going into flower. 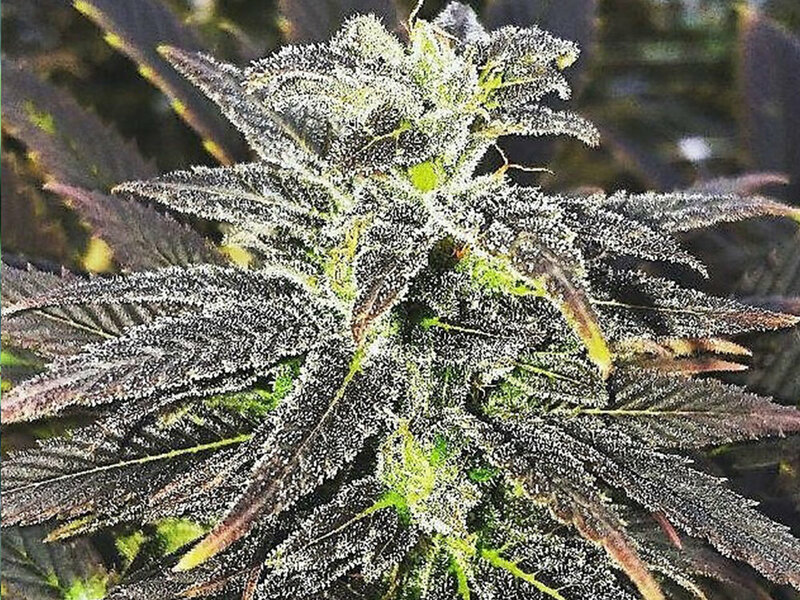 It has a wonderful terpene profile in addition to its resistance to frost or cold damage. This phenotype continues to develop even with near freezing night time temperatures. The Constance phenotype is new from our R&D department. It is a vigorous cross between a Sativa and Ruderalis with a symmetrical growth pattern. Evenly spaced laterals naturally grow vertical with stacking internodes atop each shoot. When grown outdoors, Constance will grow in even rows with little to no differentiation between plants, growing aggressively yet evenly throughout the field. It’s deep green foliage and dense flower makes this an appealing and impressive plant. When grown indoors the leaves will darken to an almost black/purple color covered in trichomes. Constance has a “Sour Diesel” type terpene profile providing a strong yet pleasant aroma. The flower will mature faster than other phenotypes producing trichomes early in the flowering stage. She has also shown to be highly frost resistant, continuing to develop even after the first soft freeze of the season. The Franklin phenotype selected by GGS is the most vigorous plant within the Otto II phenotypes, with moderate to long internodes. Franklin has shown to have above average powdery mildew resistance, especially compared to other phenotypes and genetics. This Sativa dominant plant is ideal for growing in warmer climates with a long growing season. NEW for 2019. This popular variety has been on the market for two years and is now being offered at Greenhouse Growing System for the first time. Phenotypically the wife is a Sativa leaning plant with Indica dominant leaf structures. It grows a thick stock with smaller lateral branches with mid to heavy yielding flower. Contact us about Industrial Hemp Feminized Clone availability, purchasing, and information. Select the product(s) you would like to check availability of, purchase, or know more about.